It’s that time of the year again: the temperatures are falling and the sun is setting earlier. Cooler weather may be throwing off your summer vibes but that doesn’t mean we have to say goodbye to patio weather. Let’s talk about ways to extend the use of your outdoor space! Infrared heaters are a great way to efficiently heat your outdoor living space. Infrared or radiant energy is the most practical way to add warmth where heated air cannot be contained or re-circulated. This method of heating is only absorbed by solid objects, transferring heat directly to a person, table or floor rather than heating the air. Most importantly, this heating will not blow away in the drafty fall air. Electric units are also ideal for spaces that do not offer ventilation for gas heaters. These are a triple threat because they are a heating element, a coffee table, and a sculptural conversation piece, making this item a project must. A fire pit table is an ideal addition to activate your lounge area and set the mood for communal gatherings or intimate evenings. Keep your space dry and capture the warmth from your new heating element with an operable shade system. Both operable louver and retractable canopy systems offered full shade and waterproofing for flexibly enclosing your space. Don’t let the sun, rain or cooling temps limit your outdoor living. Cooling temps can provide a good reason to spend time in your outdoor space too. What better than a Jacuzzi over-looking the city skyline or your new garden. Keep warm and relax in your hot tub long into those snowy months. Fall weather means football and lazy nights binge-watching your favorite TV series. Instead of hibernating indoors, kick on the fire pit and enjoy a cozy evening on your deck re-watching episodes of The Office and Game of Thrones. 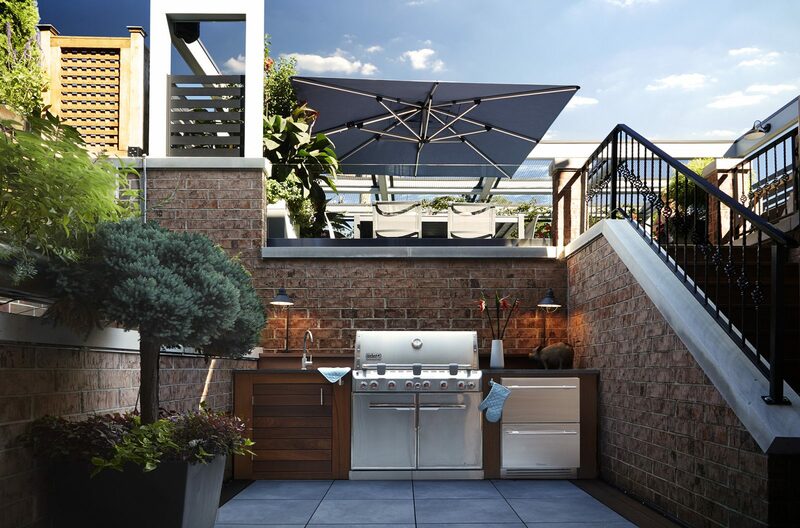 Turn your football game watch parties into a rooftop tailgate without having to leave home. Incorporating annual color is an ideal way to bring life to your space while other landscaping begins to decline. Late blooming ornamental grasses, kale, cabbage, mums and even decorative birch poles are a great detail to embrace the changing seasons while having your space feel warm and inviting. As the sun sets earlier your space should be just as functional and attractive during those evening hours. Highlight the architecture and beauty of your space with an elegant low voltage lighting system. Certain low voltage lighting systems offer color-changing fixtures to help celebrate those special holidays. For a more playful lighting solution, we recommend dimmable festoon lights strung across your space. When the weather is not ideal but that grill is still screaming to be used, a good outdoor grill will give you a reason to fire things up for your favorite meals year round. Whether it’s charcoal or gas, investing in a solid grill will allow you to maintain high cooking temperatures in the coldest of weather. Insulated devices like ceramic kamados will allow you reach and maintain proper temperature in the worst weather.